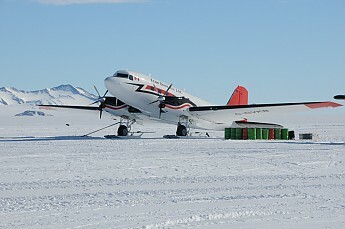 Here is a plane that landed a bit short of the blue ice runway that I visited when I was at Patriot Hills in 2006. Although it only drops a couple inches of snow a year, given enough years, snow does drift in Antarctica and cover things. 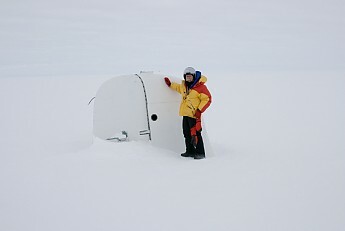 I got a ride out to the plane on a snowmobile - very cold in the wind, which is why I had my 8000 meter jacket, down pants, and the crash helmet on, as well as thick mittens. This Ilyushin is chartered from a Ukrainian company. 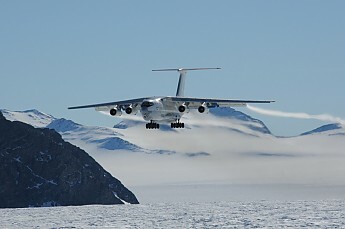 The IL-76 is one of the largest planes in existence. I've flown Kenn Borek in the Arctic. They lost one of their twin Otters a little over a year ago. Thanks for posting, Tom and Bill. Bill, the story says that Borek has two BT-67's (highly modified DC-3) named after his daughters. The crashed one was named Lydia. Painted for ALCI, the same company that runs the IL-76. All forums: Older: How to make edible water "bottles". Newer: Soft-Sided Answer to Denatured Alcohol Storage?